Check it out! Two posts in one week! Whooooo!! So I took a bunch of pictures of two of my current projects last night and thought I’d post an update. This isn’t really a dress diary but sort a halfway-there post. First up my brown Cotton day dress. So my grad school applications are done. I ended up applying to two schools, Queen’s for the Art Conservation program and UAlberta for the Textiles and Clothing program. I really don’t know which would be better for me. Who knows if I’m going to get in anywhere? The term is progressing quickly and I have a ton of work to do *sigh* I don’t see how I’m going to accomplish it all. My next big event is my french midterm this friday. Lots of revision to do over the next couple of days. Issues with the Medieval Studies program have recently been causing drama on campus. Essentially, cost cutting measures taken by the administration are going to result in negative effects on many of the interdisciplinary programs offered at Laurier. As sad as I am to hear this I have come to the conclusion, after much thought, that these changes are inevitable. The budgetary situation at Laurier is dire and the time to remedy that is long past. The Faculty of Arts administration is doing everything it can to preserve the programs but there really isn’t much they can do. I’m just thankful that I am graduating from both the Archaeology and Medieval Studies programs when I am and before these significant changes. In costuming news, I’m making an 1860’s day dress in a slightly different style. What struck me about this image was the incredible simplicity. No piping, not even a waistband! I’m reinterpreting this simplicity into a day dress that could have been worn by an average woman. 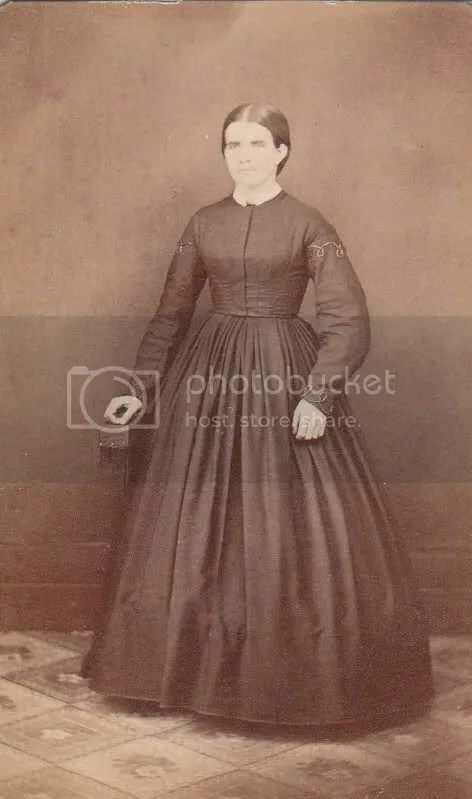 Although upon further reflection it might be quaker garb… I did a significant amount of piecing at the hem of the skirt in order to keep the skirt as long as possible. I only had 4 meters of the fabric to work with and I have used up nearly every scrap! I’ve got the bodice put together although I put pleats in instead of the darts in an effort to make it more of a work dress. I’ve tried grathered bodiced and they just don’t seem to work for me! I will post pictures of the finished project when it’s done. Did I mention I’m had sewing the whole thing? So that’s the state of the nation here in Brenna-land. I hope those of you who had a reading week enjoyed it! So in the interest of continuing my trend of posting I decided to post about my current project, an 1860’s ball gown. So I had this silk… I bought it when fabric.com was having at sale on silk taffeta a month or two ago. It’s a bit dark for my taste but it’s the first silk I’ve bought so I’m darn well going to use it! They sent me a few meters extra of the stuff because they had to send it in several pieces so there is plenty to go around. I decided to make a separate day and evening bodice that share the same skirt. See under the cut for my sketch and more details. The design for the day bodice and the skirt trimmings come for this 1856 fashion plate here. I’ve already got the bodice mostly put together but I shortened the front point and used 1860’s seam lines and such to update it a few years. The ball gown bodice trimming is from this example from Montreal’s McCord Museum which I highly recommend you check out if you’re ever in montreal. I’ve visited the past couple of summers and their special exhibits have always been excellent. 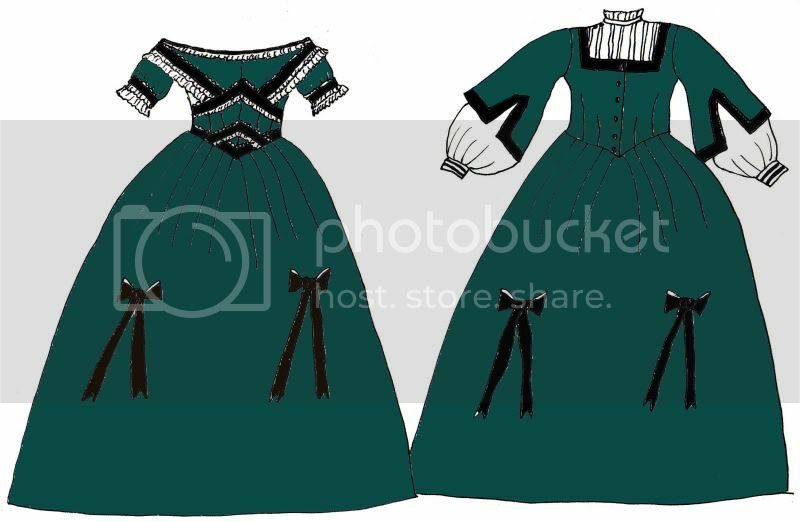 Anyway, my dilemma comes from wanting to maintain the blue(ish) and black colours of the original fashion plate but I’m not sure what the third colour for the lacing and organza trimming would be. For now I’m thinking white but it might just come down to what fabric I can find. I’m interpreting the decoration as pleated organza and net on the bottom of the ribbon with lace on top. I might even work up some simple scalloped needle lace for that. I’m way tired so time for sleep now. Good night!